It started in March 2012 when I came to my new house in Mumbai where my Hubby stays with his elder brother. Yeah, that was the entry of a 'girl' in once used to be a 'bachelor's house'. To my surprise, their bachelor's house was cleaner than how I used to keep my house before marriage. I used to live in a real mess! By then, I had already left my 16-hours-a-day job and had plenty of time without much work. The only work I had was making food 3 times a day which was something I had never done anytime in my life! The only time I made anything before this was on a weekend if I was not working and if I didn't want to eat anything my maid was making. As a result, I landed up searching the internet for recipes and always ended up watching posts on all the exotic looking cakes. I had a tiny Morphy Richards OTG (just 9 ltrs!) lying silently in the corner of the kitchen which bhai got for a frozen paratha commercial he shot (he is a Cinematographer!). I thought, why not start baking in this oven? I have always believed that you don't know baking until you know how to frost a cake. A cake looks complete to me only when its frosted. Come April and I went for a baking class to learn Light Cakes i.e. light from inside which make them perfect for icing. I was so excited that I woke up early on a Sunday morning, prepared breakfast and lunch and left for this class. The class was great and I couldn't wait to try the cake myself! The very next day, I found myself shopping for the ingredients required to make the cake. I bought Rich's non dairy whipping cream from Arife, Bandra (as had been suggested in the class), some dark chocolate (Morde for starters) and a can of candied cherries among all other ingredients. I made this cake in April 2012. Here's what you will need for making the Black Forest Cake. Preheat your oven to 180° C/ 350° F. Line a round/ square tin with parchment paper. In a bowl, beat one egg with sugar. Gradually add remaining two eggs one at a time and beating continuously till soft peaks form. Add vanilla extract and beat. This is the most important part of this cake as the sponge will get its aeration from eggs. In another bowl, sift all purpose flour and cocoa powder. Add these ingredients to egg mixture and fold it with the help of a spoon or rubber spatula. Add some water to get the dropping consistency. The batter should be so thin that if u take a spoon out, it should be free flowing. Pour the mixture in pre-lined pan and bake for 20 - 25 minutes. The cake is done when the outer surface is brown and a toothpick inserted comes out clean. Take the cake out from the pan after 5 minutes and place it on a wire rack to cool completely. Once cooled, cover the sponge with the cling film and refrigerate for a couple of hours before icing. Whisk the whipping cream with the help of the electric beater until the stiff peaks come and the cream loses its shine. Let the cream cool in the refrigerator till we ready to use it. Always use cooled whipping cream to frost a cake! Cut the sponge into half horizontally. Soak the bottom layer of the sponge with some sugar syrup covering the entire cake. The cake will get its moistness from this sugar syrup, else the icing will look fainted as the cake will absorb moisture from the cream. Apply fresh cream on the soaked sponge and then add seedless cherries. Sandwich this with the second layer of the sponge and soak it with the syrup. Cover the top and sides of the cake with a good amount of cream. Flatten the sides and top of the icing with the help of a long knife/ spatula dipped into hot water. Try to flatten the icing with minimum strokes of spatula. 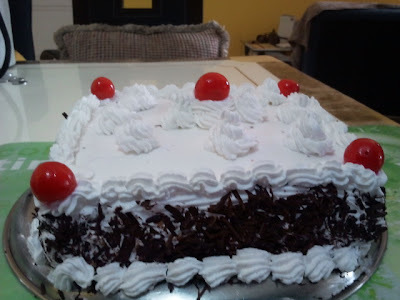 Decorate the cake with swirls of fresh cream, cherries and chocolate shavings.